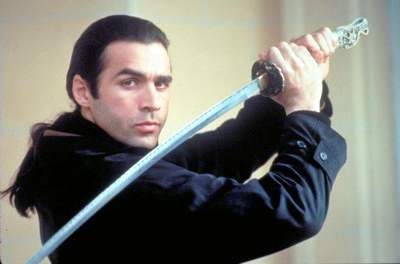 This summer at the annual Comic Convention in San Diego, I had the opportunity to interview Adrian Paul, the star of the TV series Highlander from ’90s. He has other things attached to his career, but it was Highlander that gave me the fantasy escape I needed every week. Never mind that at the time, he looked similar to my then boyfriend – no, he looked better because he had muscles – with the dark long hair kept back in a ponytail that at times would fly itself free in massive waves. Each week afforded a new fantasy flashback episode where he would be in 17th century France, World War II Russia, or some other historical time and place. Sword fighting and romance, what more can a girl want? Dreams that turn into reality? I thought he was simply one of the most beautiful creatures I’ve ever seen, close to perfect.